A few weeks ago we went for lunch At the Fattoria Luchetti Restaurant in Molino Vitelli, a small village in the Niccone Valley and a few kilometres from the Tuscany Umbria border. 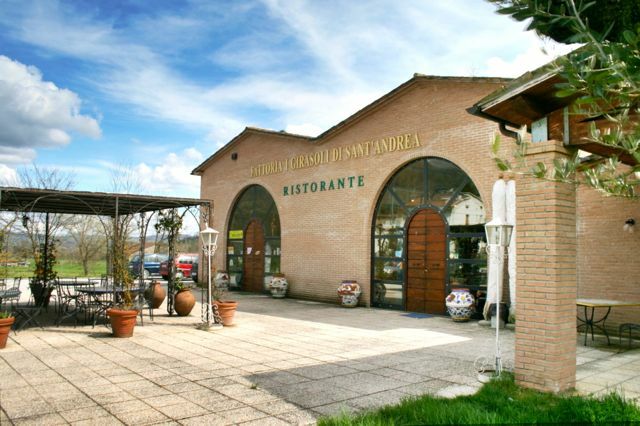 The restaurant is at the front of the Girasoli di Sant’Andrea Winery and specialises in meat from the Luchetti farm, in particular meat from the local white breed of cattle called Chianina. It being lunchtime, we chose either pasta or meat courses. I couldn’t resist having a Bistecca Fiorentina (Florentine Beefsteak), a huge piece of grilled steak cooked and served on the bone, of course, it comes from the Chianina cow! The Fattoria Luchetti Restaurant is closed on Mondays, phone +39 075 9410798 to book a table.